Colten Ellis – The Rimouski Oceanic netminder was named the recipient of the Raymond Lagace Trophy last season, awarded to the QMJHL’s defensive rookie of the year. Taylor Gauthier – The family tree runs long for the Gauthier family, as the father of the Prince George Cougars goaltender is the second-youngest of 15 children. Hunter Jones – The Peterborough Petes starter has a love for hockey, but music may not be far behind, as the budding up-and-comer can play the guitar, drums, and piano, in addition to singing. Mads Sogaard – In just his 11th game in the WHL, the Medicine Hat Tigers netminder turned aside 48 shots to record his first shutout. Samuel Bolduc – The Blainville-Boisbriand Armada blue-liner is quite the athlete, as when he wasn’t keeping pucks out of his own zone, you could find him on the field as a AA bantam baseball player. Bowen Byram – The defenseman got his name into the record books for the Vancouver Giants earlier this season when he recorded five points in a single game, a franchise record. Billy Constantinou – Despite being a defenseman, the Kingston Frontenacs rearguard chose to wear #68 after his favourite player and legendary NHL winger Jaromir Jagr. 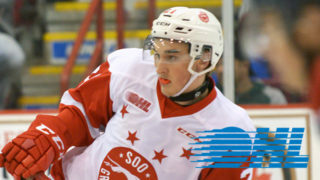 Thomas Harley – It’s a good bet the Mississauga Steelheads defenseman knows both ‘O Canada’ and the ‘Star Spangled Banner’, as he is a dual citizen of both Canada and the United States. Artemi Kniazev – You can find him on the point nowadays, but that doesn’t mean the Chicoutimi Sagueneens defenseman didn’t grow up dreaming of being between the pipes. Vladislav Kolyachonok – The season started off with some travel for the Flint Firebirds defenseman, who played just one game with the London Knights before being claimed by his new club. Kaedan Korczak – Trust this Kelowna Rockets defender to know if the oncoming attacker is a left shot or right shot, as he’s studied the handedness of all of his opposition. Jake Lee – The accolades started early for the Seattle Thunderbirds rearguard, as Lee claimed both rookie of the year and top defenseman honours in bantam AAA. Nikita Okhotyuk – A night in with a good book sounds better than catching the latest cinematic flick for this Ottawa 67’s skater. Matthew Robertson – The Oil Kings rearguard hopes to repeat his brother’s performance with Edmonton, as he captured the Memorial Cup with the club in 2014. Lassi Thomson – The Kelowna Rockets defenseman got an early taste of international success when he captured gold with Team Finland at the 2018 U-18 in Russia. 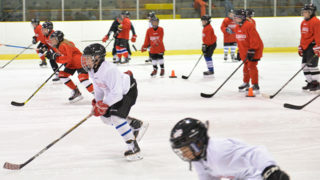 Michael Vukojevic – The signs for success were there early for the Kitchener Rangers defenseman, who was a four-time playoff champion during his days in the GTHL. Nikita Alexandrov – The Charlottetown Islanders forward was born in Germany and plays for his country nationally, but also holds Russian roots, where his father Igor starred in the pro ranks. Maxim Cajkovic will play in Wednesday’s nationally televised @SherwinWilliams CHL/NHL Top Prospects Game. 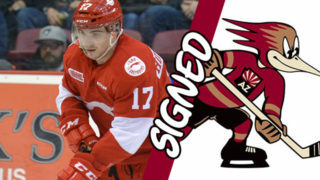 Maxim Cajkovic – Not many can say they were chosen with the top pick in their draft class, but that’s the story with Cajkovic, whose name was called 1st overall by the Saint John Sea Dogs in the 2018 CHL Import Draft. Joe Carroll – The Sault Ste. 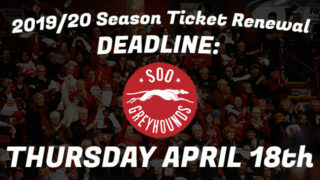 Marie Greyhounds have set a record for sending a player to the prospect showcase nine years running, thanks to Carroll’s involvement this year. Graeme Clarke – When Clarke isn’t on the ice, you can find the Ottawa 67’s forward partaking in one of his other favourite hobbies: riding motorcyles. 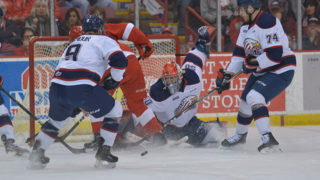 Dylan Cozens – With 53 points in just 57 games as a freshman, the Lethbridge Hurricanes forward walked away with rookie of the year honours in his first season in the WHL. Kirby Dach – The prospect showcase is another chance for scouts to set their eyes on incoming talent, while the most watched skater may be the Saskatoon Blades forward, the top ranked North American skater competing in the game. Nolan Foote – The Kelowna Rockets winger has carved out a promising career at the forward ranks despite his father being one of the game’s best-known names to patrol the blue line over 19 NHL seasons. Matvey Guskov – Alongside McMichael, the London Knights forward is one of 31 players to represent his club at the Top Prospects Game, the most-ever by one CHL franchise. Valentin Nussbaumer – With four points in four games, the Shawinigan Cataractes forward was Switzerland’s top scorer at the 2018 Hlinka Gretzky Cup. Arthur Kaliyev – The budding forward is just the third player to represent the Hamilton Bulldogs at the Top Prospects Game since the franchise’s move from Belleville in 2015. Peyton Krebs – After posting 40 points in 29 games in his final midget season, the Kootenay ICE forward ultimately became the top pick in the 2016 WHL Draft. Raphael Lavoie – Perhaps he’s following in the footsteps of former Kitchener Rangers winger Jeff Skinner, as the Halifax Mooseheads product was a figure skater before shifting over to the hockey rink. Insight from Marc Habscheid who will join @PARaidersHockey star @Bleason7 at #SWTP. Brett Leason – With 31 goals and 42 assists on the season, the Prince Albert Raiders forward is the top CHL scorer competing at this year’s prospect showcase. Nathan Legare – Keep your eye on the Baie-Comeau Drakkar forward on the man advantage, as his 11 powerplay markers are tied for top spot in the QMJHL. Connor McMichael – Like Guskov, the London Knights forward is the 31st player to represent his club at the prospect showcase, the most-ever by one CHL franchise. Sasha Mutala – He may now need to walk the talk, but the Tri-City Americans forward claims to be the best dancer on his team. Jakob Pelletier – After putting up 29 points in 17 games, it’s easy to understand why the now Moncton Wildcats forward was named playoff MVP during his final season of midget AAA. Samuel Poulin – The Sherbrooke Phoenix forward hopes to follow in the footsteps of his father, who played more than 600 NHL games and was named the CHL Player of the Year in 1991-92. Jamieson Rees – The Sarnia Sting forward and Hamilton native took in his favourite moment as a hockey fan when he watched the Bulldogs, then of the American Hockey League, claim the Calder Cup in 2007. Nick Robertson – Born in California and raised in Michigan, the Peterborough Petes forward’s date of birth was a gut-wrenching day for every American: Sept. 11, 2001. Ryan Suzuki – After scoring 59 points in 32 games in his final season of minor midget, the Barrie Colts made Suzuki the top pick in the 2017 OHL Priority Selection. Philip Tomasino – Your first goal is always memorable, but it was extra special for the Mississauga native and Niagara IceDogs forward, who netted his first against his hometown Steelheads. Josh Williams – It’s always a good day when you’re put in the same category as Alexis Lafreniere, and that was the case for the Edmonton Oil Kings forward, as the two tied for a team-high five goals at the 2018 Hlinka Gretzky Cup. 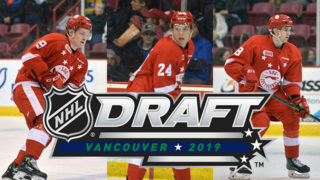 Oleg Zaytsev – The first-year North American skater will become the 25th player to represent the hosting Red Deer Rebels at this year’s prospect showcase.